Cocodāco Dance Project has a lot of new ideas about dance — how to make dance, how to be a dance company, and how to make dance for a dance company. Under their new Artistic Director David Maurice, Cocodāco is ready to push what was already a boundary-pushing vision a little further, and that all starts on Friday, April 20 at Foster Dance Studios, when they will present their three company program, HEADS / TAILS. Cocodāco’s name actually embodies this vision, it’s an abbreviation for “Community of Contemporary Dance Companies”, and their three current companies, including their Professional Company, Mezzo Company, and Youth Company collaborate in the program in a promising, and intriguing way. Johnny Nevin: Can you tell us a little about the HEADS / TAILS program? It has two premieres that you’ve choreographed, and it’s a split bill that includes the Professional and the Youth Company. What are some of the things that the Cocodāco audience will get a chance to see? David Maurice: HEADS / TAILS is my first evening of work for Cocodāco Dance Project. It’s my debut as artistic director of this organization. When considering programing I was excited by the idea of pairing the seasoned professionals of Cocodāco and the fledgling talents of the youth company side by side for one evening. With this show, you get to see the company in a new light. The setting is intimate and the repertory is more concentrated. The youth company’s abilities are incredible. The way they take in information, the way that information is reproduced, the ownership they take of any material; it’s a bit disorienting actually. I’m constantly in awe and inspired. I can’t keep up. So, I needed to see them hold the space for an extended time. I needed to see them engage in a longer process, I need to see how they would handle longer rehearsals, how they would and could captivate an audience. In someways I felt the need to issue a challenge. Unfortunately, that didn’t work out. His repertoire had an injury and fate had a laugh. So we shifted gears, we changed our mindset, flipped our agenda, we dug in to an impromptu two month process, and we created Prey. With the professional company it was happy mistake. I planned the creation of a short work. Maybe 15 minutes. Max 10 minutes. We were gearing up to perform a piece by San Francisco based Alex Ketely. Unfortunately, that didn’t work out. His repertoire had an injury and fate had a laugh. So we shifted gears, we changed our mindset, flipped our agenda, we dug in to an impromptu two month process, and we created Prey. The major treat of HEADS / TAILS is the way it is viewed. There are two unique perspectives. Two sides of audience seating and a performance in the center! I know it’s been done before but we’ve managed to build in a few surprises. Johnny: Cocodāco Dance Project has a unique philosophy as a dance company, or actually companies; in fact the name is itself an abbreviation, for Community of Contemporary Dance Companies. Can you tell us a little more about Cocodāco’s unique vision for concert dance performance? David: The model of Cocodāco came from our previous director Ronn Stewart. Its roots are as a triptych. Three companies connected, each would inform, inspire, and collaborate. We have this amazing house filled with artists. All of us are in various points of our careers. Students, preprofessionals, professionals all exist in Cocodāco. We perform together and apart. We create together and apart, but it’s all based on support. It’s powerful. It’s a strength I haven’t felt many places before. What I am hoping to see is the companies become more distinct. I’m embracing each of their personalities and each of their unique sets of needs. I’m taking this information and we are evolving. For instance, I’m seeing it’s important that the artists of Mezzo and the youth company, affectionally called Yoco, stand in their own light. We don’t and we can’t have an outside eye see the two companies under another, instead we are pushing to stand as three strong companies presenting distinct art in cohabitation. The model of Cocodāco came from our previous director Ronn Stewart. Its roots are as a triptych. Three companies connected, each would inform, inspire, and collaborate. I see this model only growing for us in the future. When I think of Ronn’s vision I know this was only the ground floor. I see the community of contemporary dance companies only growing. We will balance the quality certainly but I think our house can in time fit more artists and more companies. I see us adding another company in the near future. In this new one we would build immersive site based performances. I welcome people who have a vision for the future, who see a need for Chicago or dance in general. We have room in our house we can meet, we can talk and pan, let’s go there together. coco behind the scenes PREY from David Maurice on Vimeo. 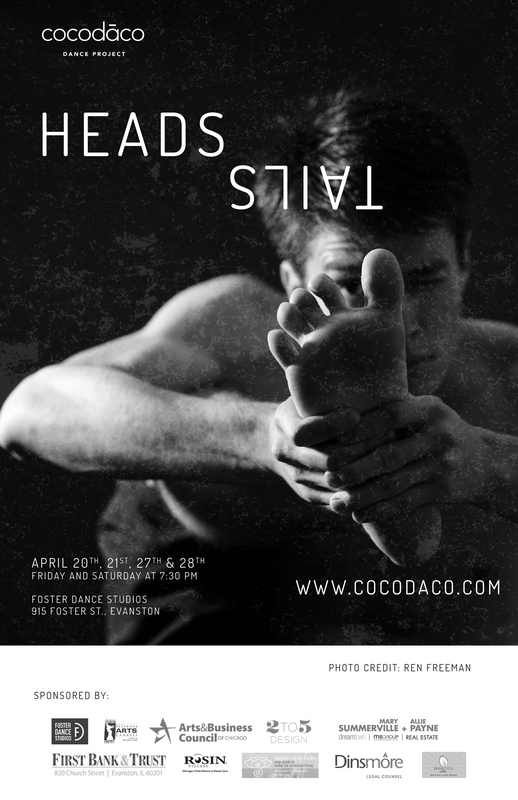 Cocodāco Dance Project will present HEADS / TAILS at Foster Dance Studios (915 Foster St, Evanston, IL 60201) on two consecutive weekends: Friday, April 20 and Saturday, April 21, and again on Friday, April 27 and Saturday, April 28. All four shows are at 7:30pm. Tickets are available online at brownpapertickets. PHOTOS: Photos by Peter Hinsdale and Ren Freeman courtesy of Cocodāco Dance Project.